Suitable for packaging powder or granular products, such as coffee, medicine, flour, fungus, peanuts, sugar, and salt etc. Related Products Name: Solid Filling Machine, Peanut Packing Machine. 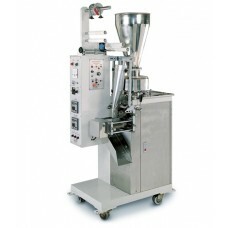 Ideal for packing of powder and granular products. Equipped with Germany imported photocell sensor to ensure high accuracy of bag forming. Equipped with Japan imported high quality thermostat, providing fast heating performance and long service life. Machine quality meets sanitation requirements. Convenient to adjust bag length. Fully automatic operation provides high efficiency and high productivity. Packaging rate 20-120 bags/min. Suits various packaging conditions. Packaging rate 20-80 bags/min suits various packaging conditions. Optional products out feed conveyor. High packing rate up to 80 bags per minute. Centralized control panel for operation convenience. Specially designed packing a wide variety of powder products.